Father, thank You for loving and accepting me today. I choose to do what is right and honor You with my attitude, words, and actions. Holy Spirit, show me if there is any area that isn't pleasing to You and help me live as an example of Your goodness all the days of my life in Jesus name amen. See Joe Cruz on the Steinway playing your favorites from the Beatles, Elton John, James Taylor, Simon and Garfunkel, Sting, Bonnie Raitt, Chicago, Cats Stevens, Crosby Stills and Nash, and some of Joe's originals that can be heard on the internet radio station BEATLES-A-RAMA. Dates are below. 7:15 pm @ The Classic WineSeller in Waynesville NC. Every morning as I enjoy my first cup of coffee I pick up my bible and get into God's word and share with my family and friends. I always find powerful promises in God's Word! Read this devotional further down on this page. This is my beautiful daughter Briley Jo Cruz devotional blog called "Let You Lead". The Lord is speaking to her in a powerful way! Please join our mailing list and stay in touch. Mailing list will be at the bottom of this page. Thanks. Joe. 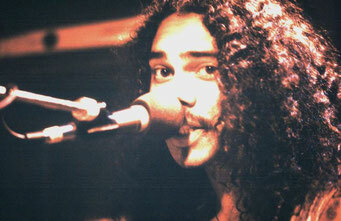 Above Picture: Joe Cruz, 1980? NY. Joe Cruz grew up in New York City, singing in church and performing ever since he was a child. Although keyboard and vocals may be considered his forte he is also an established songwriter, producer and arranger. His musical works have been used for television, movies and radio. Joe Cruz has performed in concert venues in NYC and the TRI-State area nightclubs in 1970 - 1999. Joe has performed as a headliner as well as a warm up act for the following artist: Chicago, Santana, Bonnie Raitt, Chicken Feat, Jean-Luc Ponty, Steve Ray Vaughn, Average White Band and others. Joe Cruz is currently living and performing in Waynesville, NC. Performing the best of The Beatles, Elton John, James Taylor, Simon and Garfunkel, Sting, as well as his originals that you can hear on the internet radio station BEATLES-A-RAMA. We'll be back in May, we'll keep you posted. Our Children Will Also Serve Him. Future generations will hear about the wonders of the Lord. His righteous acts will be told to those not yet born. They will hear about everything He has done. If we want our children to serve the Lord, they must hear about Him from us. It is not enough to rely on the church or those with more knowledge to provide all their Christian education. We must reinforce the lessons of the bible in our homes.